Quinta dos Caracois consists of eight attractive apartments sharing a swimming pool and is perfect for couples or families. This is a great choice for anyone not wishing to be reliant on a car - there is a bus stop just 300m from Caracois with regular, inexpensive, services to nearby Lagos and Praia da Luz. Both these resorts are great for children - Praia da Luz has a safe, sandy beach banked by reasonably prices restaurants and bars. 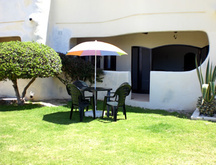 Quinta dos Caracois is also very close to the Boa Vista Golf Course . Due to its elevated position, Quinta dos Caracois has beautiful views overlooking both the Bay of Lagos and Praia da Luz. It is built in traditional style, consisting of four, one bedroom and four, two bedroom apartments, each well equipped and furnished with its own terrace, open fireplace and electric heaters for early or late season holidays. TOWN OF LAGOS--- Excellent shops, an attractive marina, a good market and lovely beaches. 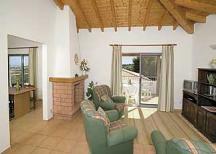 Due to the motorway,only fifty minutes drive from Faro Airport . Whilst not a "resort" in the true sense of the word The Funchal Ridge is well known as one of the most desirable residential areas between Lagos and Praia da Luz. Much of the Funchal Ridge is still undeveloped, flora and fauna abound and there are many lovely walks from the property. 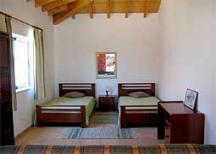 A very quiet and secluded area, only 3 kms to all the facilities of Luz and Lagos. 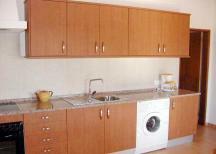 Lagos, with fabulous beaches, many with water sports, good shopping facilities, restaurants, bars and discos is 3 kms. Praia da Luz - another lovely sandy beach 3 kms. The new Quinta da BoaVista Golf Course(500metres). 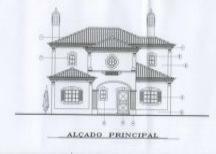 Please quote reference: a4m: 213 villa "Quinta dos Caracois"